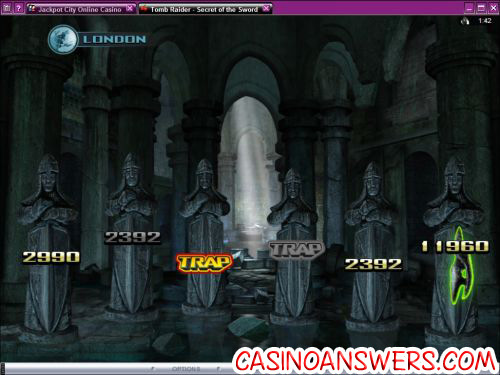 Tomb Raider: Secret of the Sword Video Slot Guide & Review - Casino Answers! Tomb Raider: Secret of the Sword is a 5-reel, 30-line video slot developed by Microgaming. It features wilds, scatters, free spins with multipliers, a bonus game and much more. You can play Tomb Raider: Secret of the Sword at Lucky Nugget Casino and 777 Dragon Casino.Play at this years #1 online casino for United States - Slots.LV. Tomb Raider: Secret of the Sword is based on the popular Tomb Raider franchise, which is best known for its video games but also encompasses two action-adventure films starring Angelina Jolie as well as novels, animated shorts and comic books. The main character in Tomb Raider is Lara Croft – a beautiful, intelligent, athletic, adventurous and even reckless English archaeologist who ventures into ancient, often hazardous tombs and ruins. 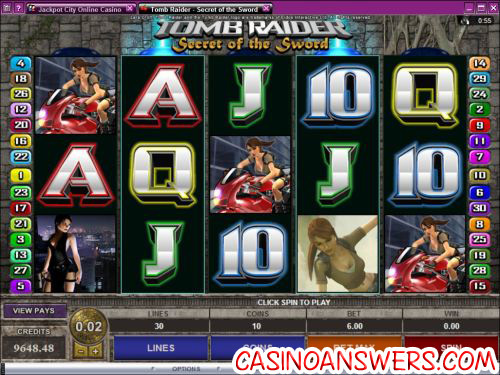 Tomb Raider: Secret of the Sword is the second Tomb Raider video slot that Microgaming has developed. It is the sequel to the original video slot, simply titled Tomb Raider. You can also play the original Tomb Raider video slot at Lucky Nugget Casino. The first slot looks great and all, but Secret of the Sword really takes it to a new level. Secret of the Sword is definitely among the best Microgaming video slots in terms of presentation, graphics and sound. Symbols in Tomb Raider: Secret of the Sword mostly involve Lara Croft in action. These actions include: climbing, firing guns, riding a motorcycle and standing in a tight leather outfit while holding a gun. The wild symbol is Lara Croft’s face, the scatter symbol is the Excalibur key and the bonus symbol is Lara’s passport. The video slot also has A, K, Q, J and 10 symbols. Only the highest win on a selected payline is paid out. Bonus wins will be added to regular payline wins. All wins will be multiplied by the coins staked per line, except scatter. Scatter wins are multiplied by the total bet staked. All wins pay left to right, except scatter, which pays any. One of the Lara Croft symbols (the one with just her face) is the Tomb Raider: Secret of the Sword slot machine’s top fixed jackpot. Five of these wild symbols and you will win 7500X your line bet. The Lara Croft wild symbol substitutes for all symbols except for scatter and bonus symbols. Two other substantial Tomb Raider jackpots are 2000X and 1000X for other Lara Croft game symbols. The Excalibur Key symbol is Secret of the Sword’s scatter symbol. Three or more scatter symbols and you will trigger the Free Spins with Rolling Reels feature. During free spins, all winning symbols dissolve causing affected reels to roll down and potentially award additional wins. Rolling Reels can result in a series of consecutive wins. Each consecutive Rolling Reels win increases the multiplier. You can win a multiplier of up to 5X. If no consecutive wins occur, the multiplier resets. The free spins feature cannot be re-triggered. The Global Adventure bonus game cannot be triggered inside of free spins. Tomb Raider: Secret of the Sword has a randomly triggered Super Mode. In Super Mode, you will be awarded 5 free spins. During these free spins, multiple wild positions are randomly awarded and held for the duration of Super Mode. Super Mode cannot be triggered inside of free spins. Super Mode and Free Spins cannot be triggered simultaneously. Whenever you hit a Passport bonus symbol in the middle row of a reel, you will activate a reel. If you activate all 5 reels, you will trigger the Tomb Raider Global Adventure bonus game450X your weighted average bet. Activated reels are held and accumulated until the bonus game is triggered. You can tell how many reels have been activated by looking for blue lights at the top of the reels. All values within the bonus games have already been multiplied by the weighted average bet taken from the time the first reel is activated until the time of triggering the feature. Any player who has ever bet a lot of money and not triggered a bonus game, only to decrease his bet and finally trigger the bonus game at the lower bet will appreciate the weighted average aspect of the Global Adventure bonus game. In the bonus game, you have to go to different locations including London, Tokyo, Bolivia, Ghana and Nepal to find fragments of a sword behind different objects. There will be six objects at each location. Three of these objects will simply have a prize behind them, two will have traps and one will have a sword fragment (with a prize). Find the sword fragment and you will move onto the next location. Find two traps in one location and the bonus game will end. The Tomb Raider: Secret of the Sword video slot has an autoplay feature. To enable it, switch the video slot over to the Expert mode. In the autoplay feature, you can set the number of autoplay spins (from 5 to 500) and to stop if a win equals or exceeds anywhere from $100 to $9999. Autoplay will stop whenever you trigger a special feature. You may cancel the autoplay feature at any time. Tomb Raider: Secret of the Sword has got everything. It’s got a well-known licensed theme that video gamers will enjoy. It’s got just short of a million special features from free spins to multipliers to a bonus game to a Super Mode. To try this amazing Microgaming video slot out, take advantage of the 1 hour of free play promotion at Lucky Nugget Casino! Are American players able to play the Tomb Raider: Secret of the Sword video slot? Due to the fact that Microgaming casinos are not accepting US players at the time, US players are out of luck when it comes to play either Tomb Raider slot machine. We recommend you try some excellent interactive slots called iSlots that are found at US-friendly online casinos such as Slots Jackpot Casino. Is there an instant play flash version of Secret of the Sword? Lucky Nugget Casino offers a no-download Flash casino in addition to the download version. If you have any problems playing the Tomb Raider Flash game in your browser, make sure you have the latest version of Adobe Flash Player installed on your computer. What Tomb Raider casino games are there?